* Do you require a standard sensor mat or PVC covered? The Emfit Tonic-Clonic Seizure Monitor is designed for monitoring and detecting seizures with muscle jerking of a sleeping person with epilepsy. Patented sensor technology detects when a person has continued abnormal movements over a pre-set mount of time, and triggers a notification. It can also give notification when a person leaves the bed and there are no more micro-movements, such as those caused by a person’s breathing or heart beating. This can be especially useful for those who have a tendency to wander. 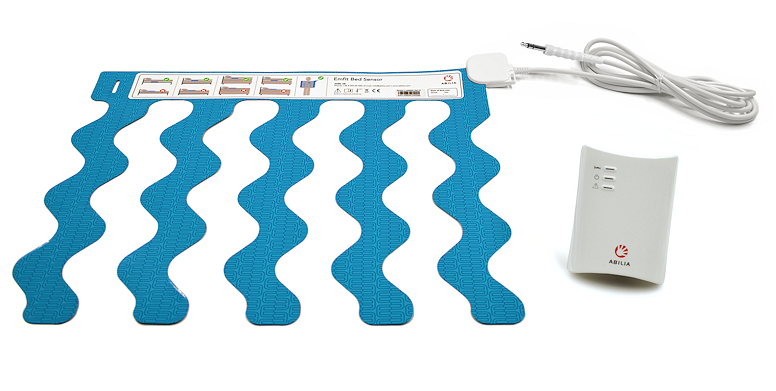 The Emfit Tonic-Clonic Seizure Monitor consists of a film-like bed sensor and a control unit. The dynamic sensor pad is placed under the mattress and detects even the slightest movements of the person lying above it, including micro movements caused by breathing and heart beating. The sensor is attached to the monitor unit with an interconnection cable. When a person has faster and longer continued movements than pre-set thresholds, such as those caused by a tonic-clonic seizure, the notification is triggered. The system can also notice light movements, making it equally suitable for small children. The Emfit Tonic-Clonic Seizure Monitor also features a bed exit function. This is useful for clients who are prone to wandering or should not leave their bed without supervision. The alarm will sound in few seconds after the person has left the bed. It also allows for a preset delay before alarming so caregivers can be notified if the person does not return to bed within the given time. This allows a pre-determined time frame to be set for the client to leave the bed without the alarm sounding, such as allowing them a few minutes to go to the bathroom. If they do not return to bed and the time limit is reached, the alarm will sound. The bedside monitor uses sophisticated embedded software and electronics. It detects the micro-movements of a person lying on bed – even heart beating and breathing, on which a persons presence and absence notifications are based. The Emfit Tonic-Clonic Seizure Monitor can be connected to most nurse call systems in hospitals and care homes using a connection lead. Any alarms raised by the sensor will then be transmitted around the home via the nurse call system as normal. We can also install a pager transmitter so that caregivers can carry a pager on their belt and be notified of any calls while on the move. In a home or assisted living environment, a wireless alarm box can be supplied so that calls can be heard in other rooms, such as a staff room, living room or sleep in carers room.